Attackers - The players who bring the puck into the offensive zone are called attackers. One or all the skaters on a team can be considered attackers. 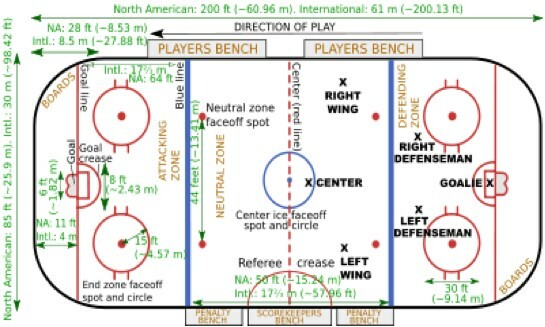 Attacking Zone - Often referred to as the offensive zone, the attacking zone is one third of the rink, inside the blue line containing the defender's goal. Back Checking - When the puck changes hands, the offense becomes the defense. When this happens, each player is typically assigned an attacker. His/Her job is to strip or intercept the puck. Backhand Shot - A shot orginating from the backhand side of the stick. Bench Penalty - Bench penalties can be called on an entire team for violating the rules. However, only one member has to serve the penalty. Blocker - The goalie has a glove referred to as the 'blocker'. The 'blocker' is worn on the hand that holds the goalie's hockey stick. It is typically used to block shots that are high on the goalie's stick side. Blue Lines - The ice rink is divided into sections by two blue lines. The blue lines are separated by sixty feet and each is twelve inches wide and reach from board to board. Boards - Boards encompass the rink and are four feet high. They are typically made of wood and are usually topped with Plexiglass for another four or more feet. Body Check - When one player contacts an opponent with the intent of dislodging the puck. Box - This is a technique used to defend against the power play. Four skaters order themselves into a loose box in the defensive zone. Break Out - An important part of hockey, the 'break out' is when a team gets control of the puck in their defensive end, then goes on the attack and quickly moves the puck down the ice. Breakaway - When a single attacking player manages to get by all the defenders and is facing off alone against the goalie. Butterfly Save - When the goalie stretches both legs in opposite directions to stop a shot. Captain - A captain's resposibility is to communicate with the referees and assist in directing the team. Every team selects both a captain and assistant captain. Catching Glove - On the non-stick hand, the goalie wears a catching glove. It is designed to absorb the high impact of a fast moving hockey puck and is somewhat like a baseball glove. Center Ice - The area surrounding the red centerline of the rink. Center Line - Twelve inches wide and red, it is the center line that divides the middle of the rink. Center - Generally taking the face-offs, the center is the middle player of the forwards. Change on the fly - When a team changes its players in middle of the action. Charging - A penalty called for taking two steps before employing a body check. It is punished by a two minute penalty. Check - Used to gain the puck from an opponent. Two forms of checking are the body check and stick checking. Coast to Coast - A player who skates from one end of the rink to the other without passing or losing the puck. Crease - The 'crease' is the semi-circular area in front of the goal. Defensive Zone - The rink is separated into zones by blue lines. The zone is the area where the teams goalie is located. Deke - The act of tricking an opponent out of position. Delayed Off Side - When an offensive player is located inside the defensive zone of the opposing team when the puck crosses the blue line. If an offensive player touches the puck 'offsides' is called. Empty Net - A team that has a trailing score will sometimes pull their goalie so as to have an extra attacking player to score a goal with. Face-Off Circle - There are five face off circles located on the hockey rink. All other players besides the centers must stay clear of the circles during a face-off. Face-Off - An appartus used by the ref or linesman to restart play. Two players from opposing teams face each other in the face off circle, the official drops the puck between them to initiate play. Flip Pass - A pass to another player that is 'flipped' slightly off of the ice. Forehand Pass - A pass that is initiated by using the forehand side of the stick. Glove Save - When the goalie catches the puck during a shot on the goal. Goal Line - A two inch wide red line that bisects the rink and is in line with the front of the net. Goal - When the puck crosses the goal line. Hat Trick - When an individual player scores three goals during a game. High Sticking - When a player's stick is raised higher than his/her waist and they contact another player. Icing - When the defensive team shoots the puck from behind the red line on one end of the rink to the other red line on the opposing end. Interference - When a player interferes with the progress of another player who is not in possession of the puck. This is generally punished with a two minute penalty. Olympic Size Rink - They are about one hundred feet in width and typically the same length as traditional rinks. Penalty Box - Each rink has two penalty boxes, one for each team playing. Players that are penalized must stay in the penalty box until their penalty has expired. Penalty Shot - When a player is fouled in a specific way, they will have the opportunity to go one on one with the goalie. Periods - Typically, a hockey game has three periods of play. They generally last between ten and twenty minutes. Power Play - When a has more players than an opposing team because of penalties. Red Line - Center line that bisects the ice rink. Slap Shot - The hardest and typically the most inaccurate shot. Slot - The slot is the area in front of the goal and stretches for about forty feet towards the blue line. Tripping - When a player trips an opposing player with their stick, legs, or arms. This is punished with a two minute penalty. Wing - Players on the offensive line that are on opposite sides of the center. Zamboni - The device used to resurface the ice. 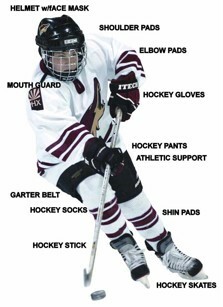 Zone - All ice hockey rinks are divided into three zones: Offensive, Defensive, and Neutral.